My name is Wayne Goodchild and some of you may know me from my adventures in writing weird fiction or uncontrollable noise (my main blog is all about those things, fact fans!) but the blog you're currently shoving into your eyeballs is going to be exclusively about my current adventures here in Colombia, where I teach English and live next to a bamboo forest as an erstwhile insect-wrangler [I deal with a lot of bugs]. I regularly find scorpions in my room! I'm from England but spent the last two years living between Australia and Texas. I applied for this job back around July 2016, via a company called Greenheart (though I'm actually employed by Heart For Change), had three Skype interviews, got accepted around September 2016, landed in Bogota on January 22nd 2017 for ten day's worth of orientation...and then moved here to Armenia at the start of February. I'll detail the whole 'before' process in a separate post, for anyone interested in what's actually involved, but for now I can tell you: it's very thorough and exciting; orientation is mental; you'll make some amazing new chums very quickly. Also, as someone who's never been to South America, it is a beautiful country - Colombia is #2 in the world for biodiversity (Brazil is #1) whereas Australia is #7 (but #1 for reptile/fish species). I honestly think Australia might be a little more beautiful, but I had two years there and saw a whole ton of cool scenery and wildlife, so Colombia's got a bit of catching up to do :D well, technically, I have, as there are plenty of different biomes I've yet to explore here. I'll update this blog at least once a month with a hefty chunk of words and pictures, but will likely post a few times depending on the amount of stuff I do/see. At the moment, there's a paro on (a teacher's strike), which means most of us Fellows (as we're referred to) haven't been at work for two weeks. You might think "Oh nice, a paid holiday!" but to be honest we all came here to work so, as nice as unexpected time off is, it's starting to get a bit boring now. Generally speaking, we all have great students (I definitely do) and miss them. I work at a school called INEM JOSE CELESTINO MUTIS teaching grades 9, 10 and 11. Ages range wildly within classes (for instance in one of my 9th grade classes I have 14 years olds next to 17 year olds) as does the English level - some kids have impeccable English already, whereas others are more like me with my Spanish; I can read it pretty well but don't yet possess the vocabulary to hold extended conversations. *touch wood* so far I haven't dealt with any overt disrespect and get on really well with my students and co-teachers (I've got kids doing The Fonz at me, thinking I invented it hahaha) and it's all-in-all an extremely positive experience. Part of the reason for this is the sheer joy at seeing a noticeable impact I'm having on the kids already, whether it's an increase in their English level, having them ask about my life, or lose a shyness that prevented them from truly participating in class. 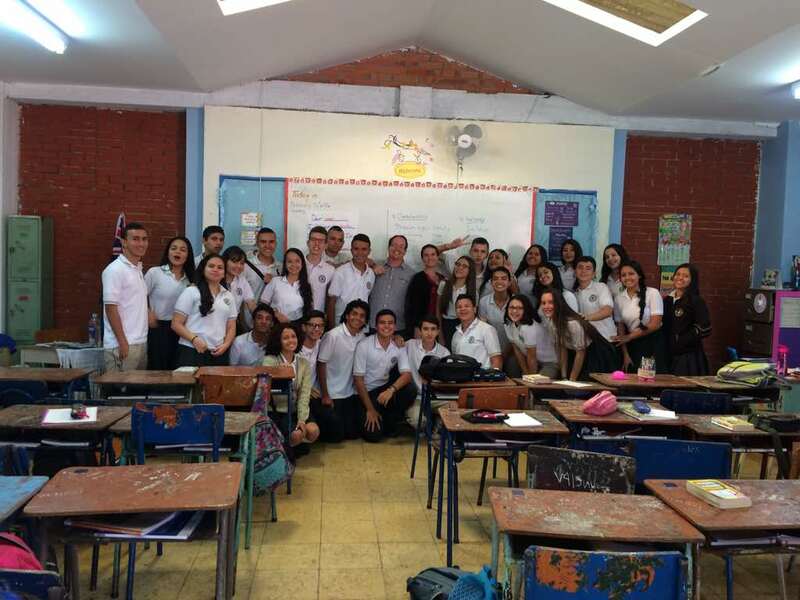 Here I am with one of my 11th grade classes! I live in a place affectionately known by all the Fellows here as 'The Bamboo House', with three other Fellows. We have a bamboo forest behind us, which is really nice to sit and admire from the comfort of my balcony (there are loads of birds living in it, including a blue-crowned motmot [pictured]). Pretty much everyone who's on this programme came here with a flexibility and tolerance for the different lifestyle, and hunger to experience a new culture (and share our own) - living with other like-minded folks is really, really nice. I'll talk more about the nitty gritty of the 'before' process and detail my arrival and first week or so in Armenia! Arts/Education facilitator from the UK turned English teacher in Colombia. Seems to attract insects like an uncontrollable super power. All images etc copyright Wayne Goodchild, you cheeky monkey. Simple theme. Theme images by simonox. Powered by Blogger.